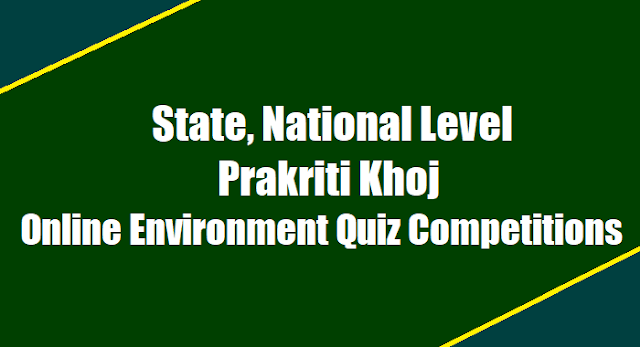 State, National Level Prakriti Khoj Online Environment Quiz Competitions 2017: The Ministry of Environment, Forest and Climate Change has launched Prakriti Khoj - an online environment quiz, where Ministry welcome our Ecoclub volunteers to take part and trigger their sensitivity towards environment protection and conservation. This quiz is one small step to instil a sense of duty among children towards nurturing the nature and natural resources. Ministry urge our children to use this opportunity and show their maximum enthusiasm for environment protection. You are the responsible citizens of tomorrow as development of the country lies in your hands. The quiz will be conducted online though multiple-choice questions. Thematic areas like climate change, biodiversity, forest and wildlife, pollution, waste management, rivers and lakes, natural history, international conventions such as Convention on Biological Diversity, United Nations Framework - convention on climate change, United Nations Convention to Combat Desertification, Convention on International Trade in Endangered Species of Wild Fauna and Flora etc. have been chosen for the quiz. A separate web portal - www.ngc.nic.in and www.pkeq.nic.in, containing information on the quiz has been developed by the Ministry. The link for first qualifying round will be open for five days from September 25 2017 to September 29, 2017 between 8.00 Am to 6.00 PM. Dates of the quiz will be updated on the Prakriti Khoj portal, as well as Ministry’s website. In this phase, the quiz is open to only students of Eco-clubs (NGC programme of MoEF&CC). The students who are members of Eco-clubs in particular schools are required to send their names for registration through State Nodal Agency. The User Id and password will be provided to the registered students though email on their personal email IDs, as well as on their school IDs. During the first phase, the Ministry in cooperation with State Nodal Agencies - National Green Corps, State Pollution Control Boards, state government bodies within the Environment departments and State Science Council will implement the quiz programme through online mode. The quiz will be organized in the school premises under the supervision of Principals/Eco-club Coordinators. There will be cash prizes for the winners. All participants will receive an E-certificate of participation duly signed by the Union Minister of Environment, Forest and Climate Change. This environment awareness initiative - “Prakriti Khoj had been launched on September 5, 2017. It has been launched with an aim to reach out to young, aspiring minds of school students through a fun-filled interactive learning mode for triggering a sense of awareness towards environment protection and conservation. This quiz, in a way, will provide a unique platform for students to measure their awareness levels regarding environmental issues and motivate them to participate in major programmes of the Ministry related to conservation and protection. Prakriti Khoj-Environment Quiz: The Quiz is an ideal medium to reach out to young mind through a fun filled and interactive learning experience to trigger their sensitivity towards environment protection and conservation. In view of this, Ministry is aiming to launch a initiative to conduct online environmental quiz competition named as Prakriti Khoj-Environment Quiz at national level. This exam in a way will provide a unique platform for students to measure their awareness level regarding environmental issues. Besides, students shall also be motivated towards their effective participation in major programmes of Ministry. Vision: The programme aims to inculcate the feeling of responsibility towards the environment protection and bring the behavioural change. Participation : It is envisaged that maximum number of children of schools under the National Green Corps (NGC) Programme of the Ministry should get an opportunity and involved in this environmental quiz. The National Green Corps programme will thus be value added through this initiative. Eligibility criteria: Volunteers of Ecoclubs under National Green Corps programme of Ministry are eligible to participate. Nominations will be received through state nodal agencies.  Round - I: This will consist of 10 questions, which will be available on the screen for 5 mins. i.e. 30 sec. per question. If student clears this round then he/she is eligible for next round. the screen for 5 mins. i.e. 30 sec. per question. If student clears this round also then he/she is eligible to play at National level competition.  Round – III: This will consist of 5 questions which will be available on screen for 2.5 mins. i.e. 30 sec per question. If student passes this stage then he/she is eligible for next round. screen for 2.5 mins. i.e. 30 sec per question. If student passes this stage then he/she is eligible for next round. screen for 2.5 mins. i.e. 30 sec per question. The dates for each round along with the time slot will be announced in advance on online portal as well as to the SNAs/participants. Approach: Ministry will oversee the programme. State Nodal Agency of Ecoclub programme will ensure the implementation of programme through online mode and effective participation of Ecoclubs. Username and password of the registered Ecoclubs will be communicated to SNAs. • For authentication of entries in the portal, SNAs will collect nomination from each Eco-club across the State. • A maximum of 5 nominations in each age group can be nominated from each Eco-club. • The entries so received from Eco-clubs and compiled by SNAs will be forwarded to the Ministry in prescribed excel format by concerned SNA. • While forwarding the names of participants, SNAs shall ensure that mobile no. and email ID of school coordinator/Principal with respect to each participant, where the login id and password of the participant will be communicated through SMS/email are provided. • For selection of participants, Ecoclub/schools will conduct internal quiz competition at school level. • A maximum of 5 nominations in each age group can be forwarded to concerned State Nodal Agency from each Eco-club i.e. a max. of 15 entries from each school for all three categories together. • He/She will have to open the portal and start the quiz as per instructions on portal. Winners will be determined by the computer/software. In case of multiple winners the decision of Secretary (EF&CC) will be final.